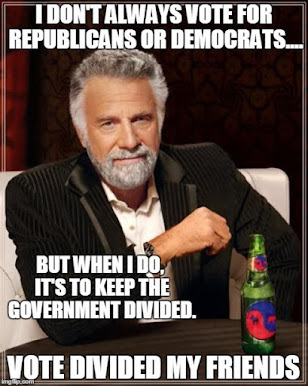 The Dividist Papers: Kudlow says "the electorate wants a more divided government"
Kudlow says "the electorate wants a more divided government"
A weekly meander through the blogosphere, stalking the elusive Divided Government meme. Lawrence Kudlow, (economist and CNBC television personality) comments on the midterms and divided government in his blog post "Lamont, Liberals, and the Midterm Election"
"On the House side, I have to believe that national discontent from the left and the right over Iraq will lead to a Democratic victory. 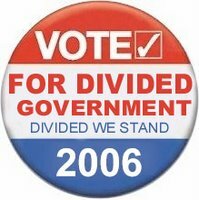 My sense is the electorate wants a more divided government, rather than Republican control in the executive and legislative branch." "Unquestionably, President Bush will veto any Democratic tax hikes, should they come about in a new Congress. Bush will put on his Grover Cleveland hat, and get downright veto-ornery on tax and spending increases (something regarding the latter, he should have done several years ago)." If it takes a Democratic House of Representatives to get this President to veto a few spending bills, well - 2 years out of 8 is better than nothing. In a very different context, Pejman Yousefzadeh makes a similar comment in this post at Red State. He is responding to a John Heileman story inNew York Metro speculating on "What If 9/11 Never Happened?". "At the same time, the electoral success enjoyed by Republicans in the 2002 midterm elections may not have happened and the Senate may have remained in Democratic hands, giving us a divided Congress. This would have engendered greater satisfaction about the political state of affairs this year (voters evidently love divided government, after all) and there would be a lot less talk about how the entire electorate wants to throw the bums out in 2006." I find it interesting that two conservatives acknowledge the Divided Government meme in such similar, backhanded way - Perhaps saying "Well, "people seem to like divided government." is as close as they can get to stating the obvious fact that our country would be better served by the Democrats taking majority control of the House in 2006. It is a hard pill for conservatives to swallow, but it is the cure for what ails us. "... more than ever, it is vital that at least one house of congress elect a majority that is not of the same party as the current administration installed in the White House ... Lack of governmental oversight is much higher when a single party controls the White House and Congress. The recent hoopla over Judge Anna Diggs Taylor's finding of the warrantless wiretapping by the Bush administration unconstitutional speaks volumes over the lack of the Congress in doing it's job... An opposition Congress can have a chilling effect on the executive branch's actions, and it should. 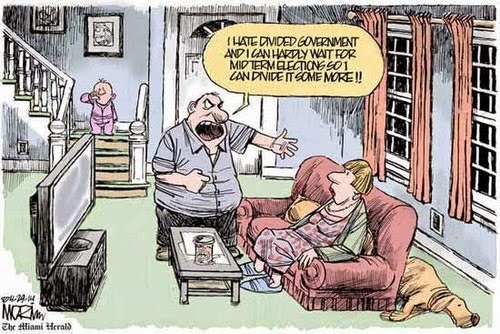 As the Cato Institute's article suggests, we seem to have better results with a divided government." " ..The outcome of Republican control has been everything Democrats were known for, and libertarians profess to abhor: wasteful government spending, titanic new bureaucracies, federal intrusion in private matters, elective war and a metastasizing national security state. "Republicans just don't act like the party of Goldwater or Reagan anymore," he [Stephen Slivinski] told his fellow libertarians at the think tank here last week. The era of big government isn't over, as Bill Clinton once professed. "It's been replaced by something far worse," said Slivinski, "the era of super-sized government — and for that we have Republicans to thank." "The corruption scandals that have afflicted the Republican Party … are a natural by-product." "Washington is most restrained — militarily and fiscally — when power is divided among the parties, Slivinski argues. In the course of American history, the country has more frequently gone to war under one-party government, and "united government gives us government that grows twice as fast." "One need look no further back than 1994, when the Republicans captured the House and lay siege to Clinton's Oval Office. A divided Washington cut the government's share of the gross domestic product from 20.7 percent to 18.4 percent, and balanced the federal budget." Then the Republicans won the White House. "This trend was reversed almost immediately after George W. Bush's inaugural parade, " Slivinski writes. "Together Bush and the Republican Congress managed to expand government spending to 20.8 percent of GDP in 2006. By this standard, they have effectively overturned the Republican Revolution. " For his fellow libertarians, Slivinski has some startling advice: Clap term limits on Republican incumbents, and elect enough Democrats to ensure divided government. "If you can't put your faith in a political party, " he says, ''perhaps you should put your faith in gridlock."